You&apos;ve seen the adverts, perhaps. “We identified 15 fund managers who consistently outdid their peers over the last ten years”. What&apos;s the deal here? Do they believe their own hype, I wonder? I would be surprised if among 8000+ fund managers, they could not find 15 who fulfilled some level of performance. But that doesn&apos;t mean it&apos;s by ability – it would still be the case if fund management performance were driven by luck. Still, relying on people not being able to accurately judge probability or understand statistics isn&apos;t a bad business plan I suppose. After over 2 weeks of living in 2 rooms of the house, and sitting next to hard-working but ultimately not-very-effective AC units, we seem to finally be enjoying a cooler spell. Today&apos;s high is 80. The forecast says that the highs this week will be around 75. Yay! Actually I was getting acclimated. But Mrs Elbeno was still suffering a bit. Well I wasn&apos;t about to dash home to deal with a few bees, and Mrs Elbeno reported no evidence of a hive. She called the pest control agency who said “unless it&apos;s a hundred bees, don&apos;t worry.” Unwilling to deal with the bees herself, she took my advice and simply closed the kitchen door and presumably lived upstairs for the afternoon (next to the air-conditioner). When I got home, I braved the kitchen only to find a small bee graveyard in the bottom of the window runner. I gave two of the ex-bees a burial in the bin and left the other five (there were apparently seven) where they were, preserved in the desert of the between-window space. 1. This procedure works for the simpler puzzles only. It does not address intermediate and advanced solution steps. 2. I have never resorted to writing little numbers since I consider it cheating. The real way to solve sudoku is to figure it all in your head. Well, duh. They are scientists. It&apos;s their job. 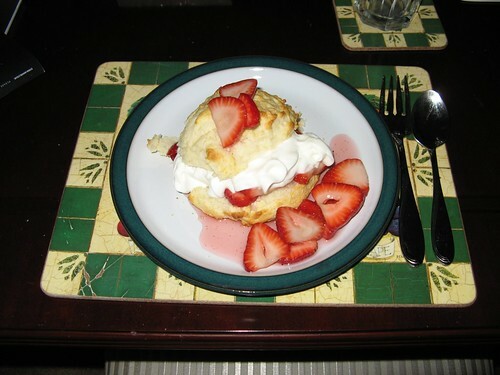 Mrs Elbeno made strawberry shortcake for dessert tonight. It is with a sense of foreboding that I read the news about Kraft Foods’ purchase of part of United Biscuits. United Biscuits make Jaffa Cakes, the nicest biscuit (or cake?) known to man and a favourite of the Elbeno household. Kraft Foods is owned by the Altria Group, which used to be known as Philip Morris (and still acts as a parent company to all the Philip Morris offshoots). Because of this, I have not knowingly bought an Altria Group brand product in a good few years now. Unfortunately, I must accept that this list of things to avoid buying could sooner or later include Jaffa Cakes, and doubtless other United Biscuits products which I have enjoyed in the past. But a man must have principles, and principles are worth nothing if ones does not stick to them when tested. This week I have been working with a colleague on optimising a piece of code. Last week, what we started out with (a first implementation) was taking over 80ms to run in my test case. We had confidence that the overall algorithm was the correct one for the job, so even without that (usually most fruitful) source of optimisation, and just by changing the code around, converting a recursion to a tail-recursion and then a loop, inlining some other functions and simplifying the resultant code, and implementing a simple caching scheme, we have achieved a one-hundredfold speedup. The same test case runs in about 0.8ms. And that’s just having altered the C++ – we haven’t even started on the highly platform-specific assembly-level optimisations that we could do. There can’t be many jobs where you can say at the end of the week that you made something one hundred times better. Mrs Elbeno bought me Silence On The Wire for my birthday. It’s been a fascinating read. There are tons of interesting things you can do with IP packets, both in the field of passive forensic analysis and for the purposes of active subversion. There are a lot of fascinating lower tech attacks on computer data as well. after 12 years, why not? You are currently browsing the Why is a raven like a writing desk? weblog archives for July, 2006.